A LinkedIn Company Page is the main hub for your business and it performs many different roles that reflect the different aspects of your brand. The Company Page is where you can tell your company story, posting news and updates and sending out marketing-related content. However, it’s also where you can share information about job opportunities. A LinkedIn Showcase Page is an addition to a LinkedIn Company Page that enables you to create a community of followers around content on a specific subject. Within a Showcase Page, you can create a very focused, relevant content experience for a particular target audience, which drives even deeper engagement with your brand. Engage Your Employees as Advocates, asking them to share links to your Showcase Page updates, and include links to the page in emails to the relevant external audiences. Include Links to the Company Page in all of your external communications to relevant customers: emails, newsletters and blog posts, for example. Share Engaging Content: Posting daily company updates is the most effective way to start a conversation, drive word of mouth, and directly engage with your target audience. Keep an Eye on Your Analytics: The only way to know whether or not your LinkedIn company page is working for you is to analyze your metrics. Be Tactful with Self-Promotion: It’s ok to self-promote at times but best to keep to articles, questions, thought-provoking scenarios, mention of others etc. Use Rich Media: Make your Company Page visually compelling by adding non-stock, non-dull images to all your updates. Follow the Company Pages of Industry Peers, Vendors, current customers and prospective customers (many of them will reciprocate the action). Also, consider following companies outside of your industry that is in your same geographic location! Set Goals: Set reasonable goals for the growth of your following on LinkedIn so you can create a plan to achieve those goals. The analytics data LinkedIn provides will make it easier for you to set goals and put your plans into action. Create a Content Calendar: Creating a calendar for your LinkedIn updates is a great way to organize your efforts. Join LinkedIn Groups: Contribute your insight in these groups. Aim to be helpful and supportive of the community. If you’re only using groups on LinkedIn to promote your company page, it will appear transparent, and the members of the group are not likely to engage with you. There will be plenty of opportunities for you to use these groups to promote your page if the members of the group see you as a helpful member of the community. What other strategies have you used to gain traction on your LinkedIn Company Page? I look forward to hearing your comments below. 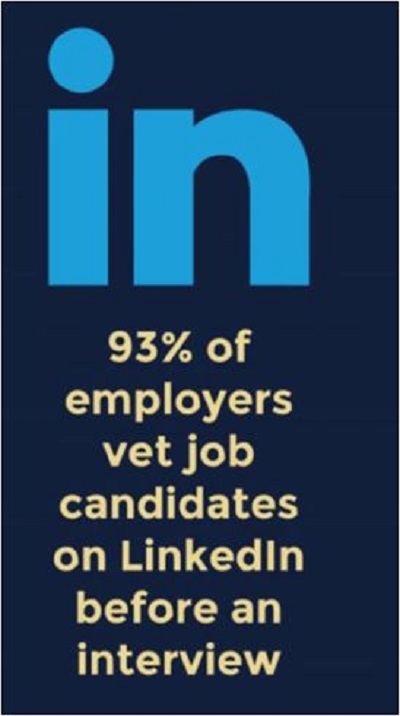 Don’t be ‘LinkedIn Shy’ 🙂 go ahead and share. Located in Washington, D.C., our goal is to make you and your profile/resume visible to job recruiters and sales prospects on a 24/7 basis. We understand you cannot be online all the time. We will strive for your online presence to work for you while you’re away.